please rely on my experience, knowledge and caring for your needs to assist you with your home purchase and or sale. I am patient and wait until you are ready never rushing you to make a decision, now or in the future. I like to make a difference in your real estate experience. I genuinely care about my/our clients. Kirstin is my daughter and partner, but she became quite sick after she lived in her house in Mold but for some very odd reason her husband did not believe there was mold and did not want to do a test to eliminate that. Finding a doctor that actually cares about the patient and not the money is a rare find today since most are under contract with hospitals who tell them what to do and how to do it. Very sad and hard to believe that this happens in America! But it is a fact. You will find that I am open, honest, upfront and it is my goal to make your move a success. We have been buyers & sellers, owned homes in Columbia and 14 other states and moved around the world. We understand what a challenging process it can be for any buyer and seller. After 15 moves we made The Greater Columbia and Lake Murray area our permanent home 1991 and love it. My passion for Real Estate, experience and knowledge about the Columbia area will greatly benefit you as well as my knowledge about surrounding communities. Since 1993 I have sold around $100 Million in real estate and have helped 100's of buyers, sellers and families move and relocate within Columbia and other states. I will help you find the neighborhood that fits your needs best, wherever you choose to explore. I listen to you and your goals you want to achieve. My/Our clients consistently find great value in our service and we work hard to earn your and their trust. Many of our clients come to us as referrals from satisfied clients and customers who buy and sell with us multiple times, please read their Testimonials on our websites. You find that I/we are patient, thorough and listen patiently. Never rush you into making a decision. Buying and selling a home within Columbia and South Carolina, across the United States or abroad we can help. We network with many qualified Realtors and CRS's all over the US and overseas. I have clients that asked me to assist them with finding them a new home in Charleston after their home in Chapin sold. I am skilled in negotiations, know contracts, will see you through the entire process from finding the right house and community to inspections, repairs, closing and beyond. Why should you choose us to be your REALTORS®? My/Our friendly and hardworking attitude has helped us gain clients trust for 25+ years. I am proud to have earned the CRS Certified Residential Specialists® Professional Designation. Only Over 30,000 REALTORS in the US and Overseas are CRS's, the highest award in Residential Real Estate. I love the opportunity to assist you with your next Home Purchase or Sale. Making sure we stay educated and up-to-date with real estate trends and laws. My Risk Management background and Kirstin’s as Accountant, attention to details, contract knowledge & financing, negotiation skills, and the knowledge of the home buying & selling process can give you an edge in negotiations as we write your Real Estate Contract. We have sold and purchased combined 17 homes ourselves. We moved across the US & International and we feel we understand your needs. We take pride in what we do and our clients have said “You love what you do and it shows”. You will find that our concern for you is genuine. I treat you the way I like to be treated. The time we spend together you will feel I treat you as a family member would buy the house. I have access to all listed properties that fit your criteria including new homes. I can and will show you all those properties that fit your criteria and price range. I can List & Sell the home that you already own. List Your Home With Me. I treat it like my own and do everything possible to give it the best marketing to get your home sold and closed and for the highest price the market bears. I look forward to assist you now or in the future. 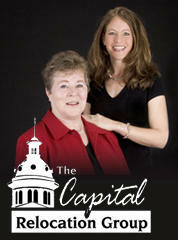 If you are leaving the Columbia area we gladly refer you to a REALTOR ® at your new destination. We stay in touch with that REALTOR® and you to make sure that you are satisfied with their service. Think of us as your 1 Stop Relocation service. We have all the contacts that you will need. As your Buyer's Agent (ABR)® I'll help you find the home that you want to purchase, no pressure. No fees. I represent your interest including when you buy a NEW HOME, I treat you as I like to be treated and make sure that you are comfortable and knowledgeable with the process. I take the time you'll need. I am patient. Whether you buy your first home, downsize or change your life style I like to be your REALTOR and assist you. You may not be aware that not all Agents are Realtors. Not all Realtors® are created equal. There is a difference. Why a use a REALTOR when Buying and Selling? Work with a REALTOR® who belongs in the top 3% in the nation. To Receive the CRS ® Designation, all REALTORS® must demonstrate outstanding professional achievements, including high volume sales, pursue advanced training in areas such as finance, marketing and technology. They must also maintain membership in the National Association of REALTORS® and abide by its Code of Ethics. REALTOR® is a federally registered collective membership mark, which identifies a real estate professional who is a Member of the NATIONAL ASSOCIATION OF REALTORS ® (NAR) and subscribes to its strict Code of Ethics. Agents that are not Members of NAR are Sales Agents and cannot call themselves REALTOR ® . We list and sell property anywhere in the Columbia and Lake Murray area. Not all real estate markets are the same. Our Listings are selling if priced right, but that is not always in our control. We bring RESULTS. * Significant exposureto more buyers on all our Internet sites, local, national, international . I am a Certified New Home Specialists ® (CSP). and like to assist you with the purchase of a NEW home. Women’s Council of REALTORS ® and more. Our goal is to provide the finest real estate services possible. To treat all customers and clients honestly, fairly and to give every client the level of service that EXCEEDS their expectations. Kirstin and I strive to be well informed, courteous, competent, accessible and thorough from locating that special property or marketing your property for sale to the completion of the transaction. I look forward to hear from you. Thank you for your visit and please come back. Please sign up for our monthly newsletter and don't forget to visit all our other web sites. Herzlichen Dank fuer Ihren Besuch hier. Ich kann den Hauskauf und Verkauf leichter machen.Ich spreche fliessed Deutsch. Seit 1996 haben Kirstin, meine Tochter, und ich sehr vielen Kunden beim Verkauf und Kauf geholfen. INFORMATION HEREIN DEEMED RELIABLE BUT NOT GUARANTEED!